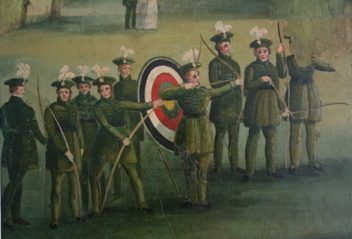 Archery in the Violet Hill area of St Johns Wood in the late 1700’s had become very popular, long before the residential development that was to take place around 1860. The area was originally on the boundary of the Harrow & Eyre Estates and formed a medieval lane linking Lisson Village to the Priory at Kilburn…. a good place to site an inn. And so it came to pass that around the year 1834, a bowyer, a certain Mr. David Freeman, constructed a pavilion in a convenient location within the archery grounds. In the same year the Royal Toxophilites Society – (literally, – a lover of the bow) – settled their headquarters in Regents Park. 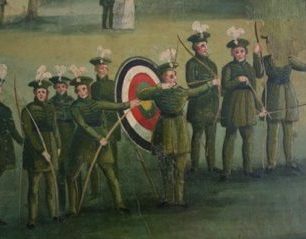 Also in 1834, the Queen, then Princess Victoria, herself a toxophilite, presented a banner to the recently formed Archery Society of St Leonard’s Hastings, later renamed the Queen’s Royal St Leonard’s Archers. And, possibly to commemorate other major tournaments or events of 1834, this is the date that appears in the wall paintings recently discovered in the main room at Violet Hill Studios, the former Abbey Tavern in Violet Hill. However….. and it’s a big however,….. the Abbey Tavern was not built until 1844; this, therefore has required further research into the hidden mysteries of, not just the Abbey Tavern, but also David Freeman’s Pavilion. We discovered two sections of wall paintings in the main room of the old Abbey Tavern, which were barely legible due to a thick layer of darkened varnish and beneath this, a thinner, less discoloured varnish. 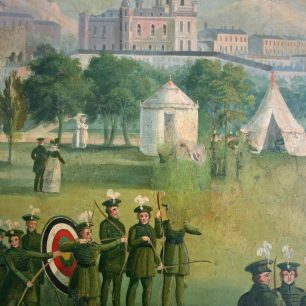 Through a painstaking process of careful restoration, the layers of wallpaper and varnish were removed and what emerged was part of a colourful scene depicting a field of uniformed archers and spectators set within a type of painted framework. Of great significance was the survival of part of an inscription and the date; the complete wording is believed to be “Royal Toxophilites Society AD1834”. The process of the second mural restoration was similar to the first; and the emerging scene was no less exciting. Part of an inscription was revealed to be “Queen’s Royal” and the scene is of a broad open field receding into the distance with an urban background and snow covered mountains which stretch to the sky. 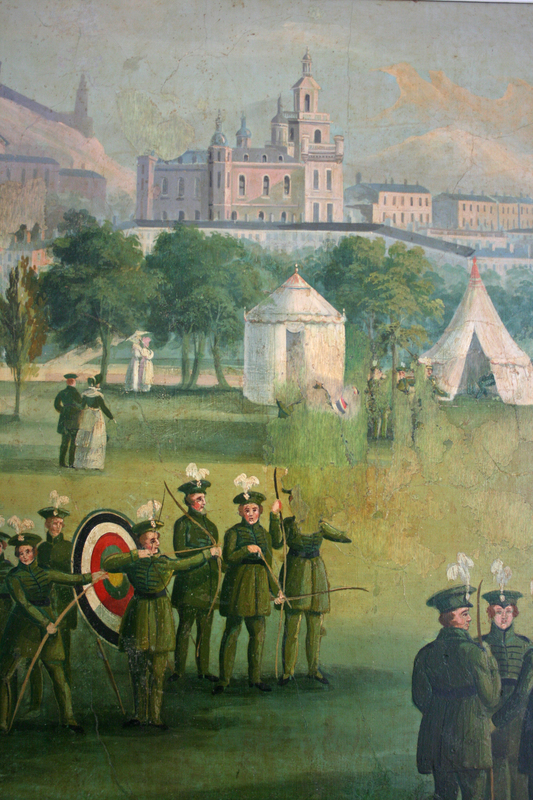 The foreground shows groups of uniformed archers, distinct from those in the first mural by their plumed caps and braided jackets. Tents and pavilions, a uniformed band and couples walking amongst the trees are depicted in the mid-ground. The ladies are presented in the most fashionable dress,…. draped skirts, ribbon and lace trimmings, and with hats perched high over elaborate hair creations. The urban background consists of rows of terraced houses, a large church, and possibly a castle above a steep escarpment. Both murals emphasising the very social occasion of the sport with the inclusion of men and women. These unusual wall paintings have remained in darkness for the best part of 150 years; was the room the painted pavilion, or part of it?…. who was the artist?…. and how much more of the room has been decorated in the same way….? We don’t have a solution to the conundrum of the ‘1834 murals’…….but we can admire their mystery. This page was added on 04/04/2012.